There have been a lot of memorable brand taglines over the years. Now, you get to decide what the most iconic one of them all is. A great brand tagline or ad slogan can leave an indelible mark on the industry and live in the minds of consumers for decades...but is there one that stands out above the rest as the best ever? We selected 64 of the most iconic campaign or company mottos of all time, assigned seeds to them (1-16), and placed them in a bracket. To keep things fair, we divided the contestants into four regions: Food (Stuff Your Face); Beverages (Chug-a-lug); CPGs, non-food/non-beverage category (Buy But Don't Eat); and Miscellaneous (This and That). Over the next couple of weeks, we will post polls on this page with all the matchups in each respective round. Your vote will determine who moves on and who goes home. The winner will be announced Tuesday, April 9. Voting for the championship round is open now. Polls are located below the bracket. Form largely held in the Buy But Don't Eat, and This and That regions, with seven of the eight higher seeds advancing in each. The only lower seed to win its first-round matchup in the former was 11th-seeded Alka-Seltzer ("Plop, plop, fizz, fizz, oh what a relief it is") knocking off No. 6 De Beers ("A diamond is forever"), while in the latter, Disneyland's "The Happiest Place on Earth" — the 15 seed — bounced second-seeded "The few. The proud. The Marines." Mayhem abounded in the Stuff Your Face Region, with four lower-seeded entries advancing to the second round. The biggest upset of the bunch came courtesy of Skittles' "Taste the Rainbow," which eliminated third-seeded "Snap! Crackle! Pop!" (Rice Krispies). In the Chug-a-lug Region, Snapple and its "Made from the best stuff on earth" tagline upended Miller Lite's "Tastes great, less filling" in the case of an 11 beating a six. Skittles ("Taste the Rainbow"), the 14 seed, continued its Cinderella run through the Stuff Your Face Region, eliminating 11th-seeded Pringles ("Once you pop, you can't stop") to set up a round of 16 matchup with No. 2 seed KFC ("Finger-lickin' good"). The only other double-digit seed remaining is No. 11 Alka-Seltzer ("Plop, plop, fizz, fizz, oh what a relief it is"), which sprung the upset over Apple ("Think different"). That sets up a showdown between the antacid and seventh-seeded Timex ("It takes a licking and keeps on ticking"), which got past No. 2 seed Gillette ("The best a man can get"). All four No. 1 seeds advanced to the round of 16. All four No. 1 seeds won easily. Two of them — Nike ("Just do it") and Las Vegas ("What happens here, stays here") — find themselves squaring off with No. 7 seeds in the next round: Timex ("It takes a licking and keeps on ticking") and American Express ("Don't leave home without it"), respectively. Second-seeded KFC ("Finger-lickin' good") was locked in a tight battle with the 14 seed, Skittles ("Taste the Rainbow"), but it pulled out the narrow victory and will meet top-seeded M&Ms ("Melts in your mouth, not in your hands") to determine who advances to the semifinals. The Chug-a-lug Region saw the top two seeds ("Got milk?" and "This Bud's for you") win comfortably and move on to face each other in a marquee quarterfinal matchup. 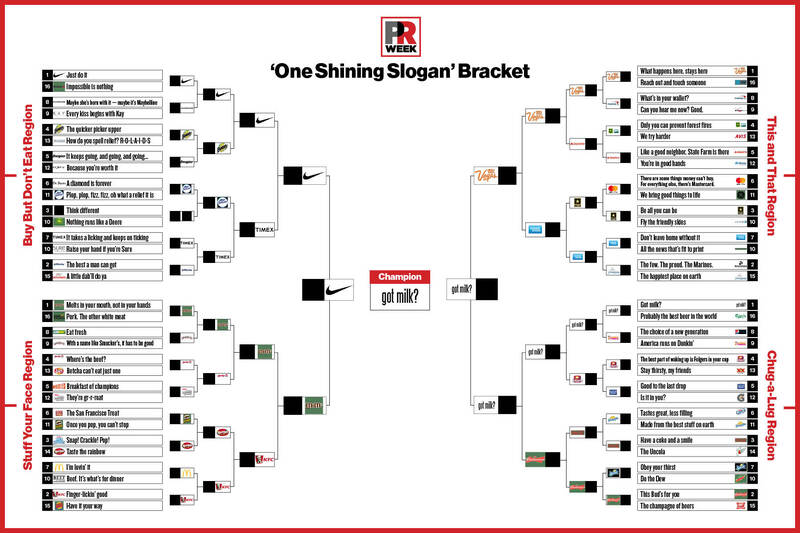 Somewhere, the selection committee for the "One Shining Slogan" Bracket is smiling. That's because all four No. 1 seeds made it the semifinal. Nike ("Just do it") continued its dominant run through the Buy But Don't Eat Region by dispatching Timex ("Takes a licking and keeps on ticking") to set up a showdown with M&Ms ("Melts in your mouth, not in your hands"), which got past KFC ("Finger-lickin' good"). On the other side of the bracket, Las Vegas ("What happens here, stays here") ousted American Express ("Don't leave home without it") to win the This and That Region, while "Got milk?" downed Budweiser ("This Bud's for you"). Those two heavyweights will meet in the other semifinal matchup. Somehow, we knew we'd end up here. Even with such a strong field of competitors, it should come as little surprise that the last two slogans standing are "Just do it" and "Got milk?" The latter claimed another easy victory, routing "Melts in your mouth, not in your hands" in the semifinal, while the former staved off a spirited effort from "What happens here, stays here" to set up a true battle of the titans in the championship. Click the bracket to enlarge. Which is the better tagline/slogan?